Unlike the West, the rapid growth of the mobile internet in China has created fertile soil for innovative financial services in the space of just a few years. A study in contrasts. Zhang Senhua, 34, a fintech entrepreneur in Beijing, has discovered a lucrative niche for his company Duocaitou: he makes dreams come true. Zhang himself wouldn't phrase it quite like that; until recently he was an investment banker at Bank of China International. Facts and figures are the foundations of his profoundly rational world. And yet the mobile crowdfunding platform founded by Zhang, Duocaitou, has already made 70 business dreams a reality since June 2015. Duocaitou specializes in finance for boutique hotels, which are currently springing up on China's mountainsides and coasts like bamboo shoots in spring rain. One example is the new Shan Shui Jian hotel, whose name can be translated as "between mountains and water." The modern boutique hotel opened recently at the foot of the Huangshan, the famous Yellow Mountain of China's Anhui province. The owner had a dream, and now it's come to life: a 300-year-old traditional Chinese dwelling, extended and flanked by a modern glass and steel construction. Starting at ¥1: Fintech money market funds like Yu'ebao are popular with China's youngsters. Back in June of this year, the project had not even been live on Zhang's crowdfunding platform for 24 hours before the ¥3 million (approx. $438,400) needed to finance it had been raised. "In terms of volume, our project is absolutely perfect for China's new middle class," says Zhang. On average, the investors who finance dreams like this hotelier's on Duocaitou part with ¥53,000, or just over $7,700. And they do it from their cellphone using WeChat, an immensely popular app in China that functions like WhatsApp, but also offers payment services. 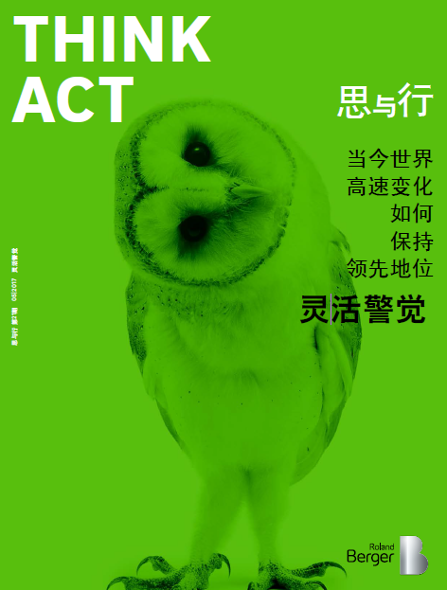 The crowdfunding platform uploads hotel photos and project descriptions onto its company's official WeChat account, the customer clicks a few times, an investment contract with the projected dividends is sent directly to their cellphone screen, where they can sign it with their finger and quickly press "send": another white collar worker in Beijing, lawyer in Shanghai or doctor in Guangzhou becomes an investor. The Duocaitou platform steps in where China's financial markets have previously feared to tread, and it does so in two ways. It's not just the case that entrepreneurs would not find credit for this kind of hotel project anywhere – China's state banks are just as conservative and risk-averse as major banks the world over. It's also that the increasingly wealthy middle class in China struggle to find legal channels to profitably invest their disposable income: the communist government in Beijing strictly controls the property market because any overheating of that market could quickly lead to civil unrest; high deposits are required before you can be approved for a mortgage, and the number of homes available for any Chinese person to buy is regulated. It is also very difficult to invest abroad. The flow of currency out of China is very stringently restricted, making the transfer of credit to overseas accounts effectively only a realistic option for the new super-rich. Interest on bank deposits in China is also very low. Crowdfunding platforms such as Duocaitou can therefore position themselves as the missing link between unproductive capital and risk-tolerant companies, creating a completely new interface between the financial and property markets and the mobile internet. "Our projects promise good returns, right from the first year, but our borrowers often start off without even owning the land, and the banks would rarely lend them money," says Zhang. It is often those same middle-class people who head out of the city in their BMWs or Toyotas on a weekend to a chic boutique hotel who used Duocaitou to invest in that hotel. The entrepreneur describes his crowd-investors as 25 to 45 years old with one or two children and an annual household income of around ¥500,000 (approx. $76,300), ¥200,000 of which is disposable income. 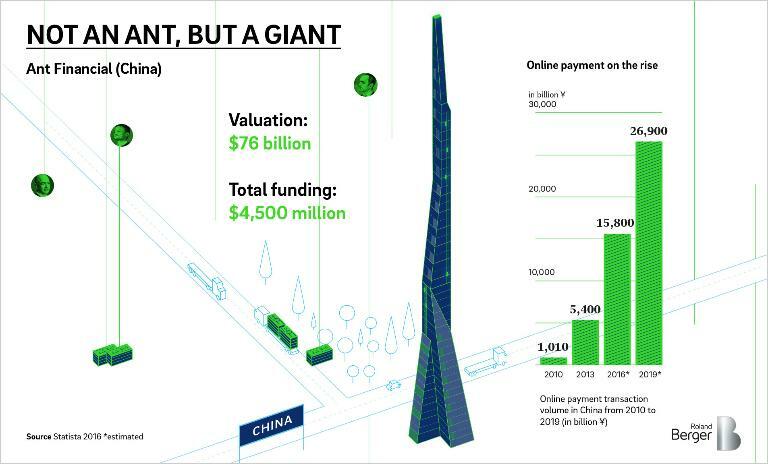 The phenomenal success of WeChat, developed by internet giant Tencent, has created an ecosystem in China in the space of just a few years in which fintech companies like the one headed by zhang senhua can grow faster than would be conceivable anywhere else on the planet. WeChat is one of the world's most successful messaging platforms with more than 800 million active monthly user accounts, almost all of them in China (WhatsApp reached 1 billion users in 2016). A blend of a messaging app à la WhatsApp, social media network like Facebook and an e-commerce platform, WeChat is the most important app in China and the one people spend the most time using. The Chinese use WeChat to chat and send files, to read specialist media and to buy rail tickets. You can pay for the noodle soup from a street food vendor for ¥10 via a WeChat payment provider, just as you can for a ¥100 taxi journey with the Didi Chuxing ride hailing service or send ¥1,000 in emergency funds to your son in college. It's not an unusual sight to see crowds of Chinese people crossing the street in Beijing or Shanghai, eyes glued to their cellphone screens. Most of them are hooked on to WeChat even as they walk. The rapid growth of the mobile internet in China has now created a vibrant market for finance-oriented technology firms. "Fintech – from mobile payment and crowdfunding to new technologies such as artificial intelligence for asset management – is currently experiencing a boom in China," says zennon kapron, who previously worked for Citibank and is now a fintech specialist advising entrepreneurs in Shanghai at his industry market research firm KapronAsia. It is primarily big internet companies such as Baidu, Alibaba and Tencent, a triumvirate often abbreviated to BAT, which have the most success with their own fintech investors, says Kapron. "But there are hundreds of interesting fintech startups in Beijing and Shanghai." According to a recently published report in China Daily, China is one of the fastest growing fintech markets on earth and it was reported that $4.5 billion in new venture capital flooded into Chinese fintech firms in 2015, more than four times the figure for the previous year. That accounts for around 20% of worldwide investment in this sector. The superstar of the new fintech sector in China is Ant Financial, once the payment arm of the Chinese e-commerce giant Alibaba. It has now been trading independently for the last two years and achieved a market value of $76 billion in its latest round of financing in April this year, making it worth almost as much as the US investment bank Goldman Sachs. Alibaba Founder jack ma created his own third-party mobile payment firm, Alipay, in 2004, initially out of sheer necessity: he needed to make payment for packages from his internet shopping platform Taobao easier for consumers on their doorsteps. By 2011, it was so successful that it became its own separate entity. Today, Ant Financial – a comprehensive fintech company that evolved from the early days of Alipay and still includes the payment service among its offerings – has 450 million active users and takes care of 170 million financial transactions every day. For Ant Financial – and indeed many Chinese fintech companies – the key to success lay in addressing the needs of a large population often ignored by traditional banks. That was something Jack Ma saw when he founded Ant Financial's first money market fund Yu'ebao in 2014. Chinese consumers, already used to making day-to-day payments with Alipay, could now invest money with just a few clicks on their cellphones. And with a minimum investment of ¥1. That was something that traditional banks did not offer, and it won over the young Chinese – within just two years, Yu'ebao had become the world's second-largest money market fund. According to Forbes, the fund manages $90 billion for more than 260 million investors. "It's a real difference from the USA, where fintech firms have to change an established market if they are to be successful," says Zennon Kapron. "In China, many fintech companies are still able to start small, and then continuously introduce new products." In comparison, the initial hype surrounding fintech has already cooled significantly in the USA. Industry achievers that were celebrated just a few years ago, such as the Lending Club – Founder Renaud Laplanche was heralded by the media at the time as the "next jeff bezos" – have all lost significant market value. Nevertheless, there are dozens of American first-wave fintech unicorns, startups that have already achieved a market value of a $1 billion or more. However, another success like PayPal is not currently likely. George is a hybrid creation: one part accounting app, one part budget book 4.0. On top of the usual features found in most banking apps, George offers many additional tools. George will not only track your spending, he will also analyze your spending behavior and categorize the results. George also keeps a complete archive of previous transactions – a very handy tool come tax time. Notably, George is not limited to savings accounts at Erste Group: the app also integrates with accounts at other banks. George is surprisingly intuitive and easy to use – hence the 700,000 users logging in nine times per month. In contrast to China, the American market is no longer being changed by young startups that are threatening established competitors and inventing completely new business models. It is the banks themselves that are embracing the technology and "fintech-izing" their business processes. Goldman Sachs has been one of the most active investors in the fintech sector for several years. The Wall Street bank has not only acquired shares in payment service providers such as Square and Bluefin, but has also invested significant sums in Bitcoin startups and big data. Bank of America (BoA) holds its own annual Technology Innovation Summit in Silicon Valley. So far, this has given 300 startups the opportunity to present their ideas, and dozens of them have left the event with a cooperation agreement in their pockets. BoA has a yearly budget of $3 billion for new technologies, digital projects and startup acquisitions. "Our appetite for innovation is tremendous," said Cathy Bessant, COO and CTO at Bank of America, in an interview with the San Francisco Business Times during the summit. Many of the fintech revolutionaries from the early days have since proven to be less radical with regard to the role of established banks. It wasn't so long ago that Brad King, Founder of the mobile bank Moven and author of the book Breaking Banks, proclaimed the "death of the merchant banks." Now he promotes cooperation rather than confrontation. "We can't continuously position ourselves solely as rebels," says King, "or the banks will regard us as their enemies." Instead, it's friendly overtures from fintechs. Something similar is happening in Europe. Deutsche Bank is planning to invest €750 million in its digital strategy. Germany's biggest bank is currently creating a digital thinktank with 400 employees to concentrate its R&D in-house. The ING Group in Amsterdam has opted for a different approach and is working with 40 fintech startups in order to learn from them. ING CEO Ralph Hamers describes this strategy as "innovation from within." In Vienna's financial district, Boris Marte, Project Manager at Erste Group Bank AG, apologizes for his brown loafers, worn without socks. With his shoulder-length gray hair and slim-fit suit trousers, the 51-year-old has a rather unorthodox style for a banker. He studied cultural philosophy, he says with a chuckle. Marte was involved in the development of a new app for Erste Group called George that has already been downloaded 36,000 times, and Marte is visibly proud of his creation. George is primarily a personal finance manager, but it's also much more than that – it is its own ecosystem and will wow millions of people in the near future. Whether that happens remains to be seen, but it does already have 700,000 (app and website) users, which is a considerable figure for Austria. If current growth is sustained, one in 10 Austrians will be using George by next year and the app will be a further example of the new symbiosis between fintech and established financial companies. 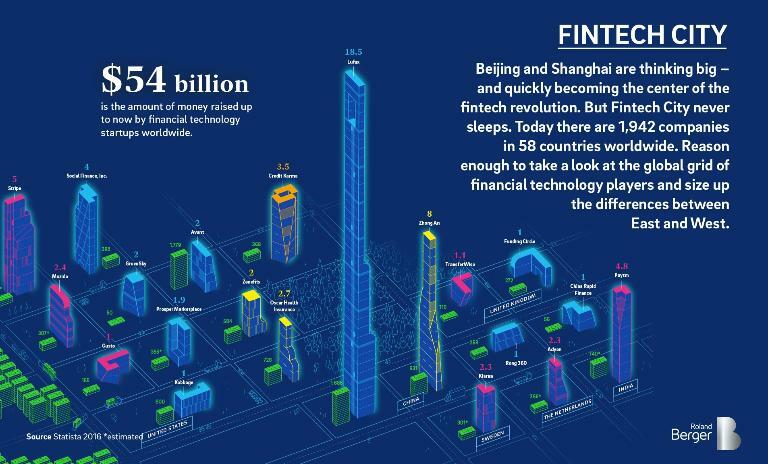 Beijing and Shanghai are thinking big – and quickly becoming the center of the fintech revolution. But Fintech City never sleeps. Today there are 1,942 companies in 58 countries worldwide. Reason enough to take a look at the global grid of financial technology players and size up the differences between East and West. There is a different kind of optimism at work in China. 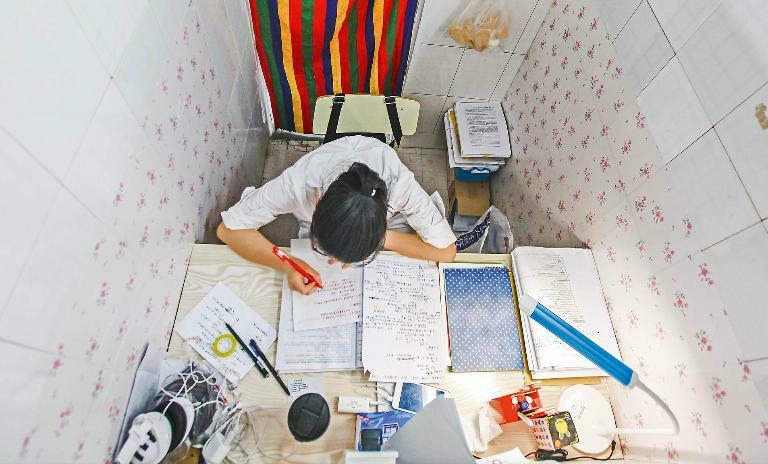 Hundreds of ambitious startup companies toil away in Beijing's student dormitories, in their founders' cheap studio apartments or in their first offices, financed with money from angel investors. Micai falls into the last category. The fintech startup has rented two floors on the 26th story of an office tower block to the north of Beijing's Third Ring Road. Belgian gregory van den bergh paints huge visions directly onto the whitewashed wall with a marker. "We want to become a kind of Microsoft Windows for asset managers," says the 27-year-old entrepreneur. "Think big!" is the motto of many Chinese startups, and it certainly applies to Micai. Fifty programmers and other employees, most of them fresh out of university, sit behind him in two open-plan offices and create software that is set to automate traditional portfolio management with the aid of artificial intelligence (AI), according to their boss. Van den Bergh has also already developed a "robot advisor," a digital investment consultant armed with algorithms. Unlike a human advisor, whose investment tips are often based more on his own interests than on objective criteria, Micai's investment robots are fed only with verifiable data. An obvious choice for entrepreneurs seeking both opportunity and talent. Long a center for all things financial, it was a natural to move to the front of fintech – but will Brexit change its status? In just seven years, the number of fintech startups has exploded – from 90 in 2009 to 500 today. The government bolstered fintech with an innovation lab and international agreements. A rising middle-class of ready adopters is pushing the Chinese capital to the forefront of fintech. To date, innovations in asset management have only taken place at one point in the value creation chain, in sales, says Van den Bergh. "We want to have an impact at all stages, including the asset management back office and middle office," says Van den Bergh. He has an ambitious goal. He wants his own cloud-based software to replace the Excel files that asset managers all over the world have used up to now to manually type in their key data. He has already carried out two rounds of financing to bring in investors. "I am convinced that fintech firms with innovative technology in China currently have the best prospects," says Van den Bergh.